Green bricks are environmentally friendly alternative to concrete and high-fired clay bricks. Why do we need greener options for making bricks? Here’s a quote from IDSN MOW “1.3 trillion bricks are manufactured on earth each year, and at least 10% of which are made in coal-fired ovens, on a whole releasing 800 million tons of CO2 annually.” In addition, clay bricks often destroy valuable topsoil. 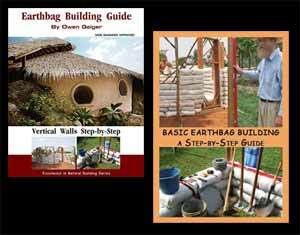 We need affordable, locally made, low tech eco bricks for the masses. Here is a list of leading eco-friendly green bricks. Recycled glass brick: BEEcycle is currently researching a solution for glass waste by breaking down glass bottles into sand which is then used to create eco-bricks for paving and construction. The GS100 machine is designed to turn glass waste into sand grade sizes. The glass is then used to replace normal sand in brick maing rendering the eco-bricks more eco-friendly with over 70% of it being waste material. At the same time, the eco-brick looks, feels and functionality is exactly the same as conventional bricks. Microbial-induced eco bricks: Ginger Krieg Dosier has won the Metropolis Next Generation Design Prize for her design of “green” bricks using sand, common bacteria, calcium chloride, and urea (compound found in urine), using a process called microbial-induced calcite precipitation. Update: Dosier is the winner of the 2013 Postcode Lottery Green Challenge. It sounds like her team is making good progress. Timbercrete ‘sandstone’ brick: Being half the weight of clay or concrete, bricklayers can easily lay this sandstone brick with one hand yet they are laying three brick sizes in one, the dimensions being exactly one and a half times the length and two times the height of a standard clay brick also means it will take a third of the time and third of the mortar which means a third of the cost of labour to install. It looks phenomenal, you can nail it like timber, it has loadbearing support for double brick construction and has the highest fire rating that a masonry product can achieve. Save Water Brick: The Save Water Brick design by Jin-young Yoon and Jeongwoong Kwon is comprised of a mixture of recycled plastic bottles and dried, rotting leaves molded into a traditional brick shape. Recycled newspaper bricks: Two researchers from the Visvesvaraya National Institute of Technology in India (VNIT) have developed eco-friendly, energy efficient bricks made from recycled newspaper. Professors Rahul Ralegaonkar and Sachin Mandavgane hatched the idea to create these bricks after a trip to local paper mill two years ago. They learned at that 15% of newspaper cannot be recycled and goes to waste. This, combined with the fact that India suffers from a brick shortage of about 30%, inspired them to manufacture bricks from the paper mill waste. Green Brick from CalStar: CalStar Products has introduced fly ash brick and fly ash paver masonry for the green building market. 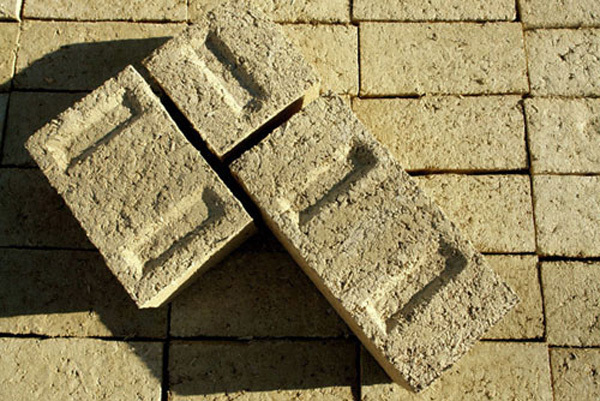 These products contain 40% post-industrial recycled material, use 90% less energy to manufacture and generate 90% less CO2 than traditional fired clay brick and pavers. They are available in eight colors and have been designed to be price competitive with traditional products of equivalent quality. Green Leaf Brick: 100% recycled scrap. Green Leaf Brick are not recycled brick, but are quality, newly manufactured red , burgundy, and brown brick made from select materials that are rescued from landfills, open pit mining byproducts, and plant refuse. No new lands are mined to secure materials for use in the manufacturing of Green Leaf Brick. Included in these carefully selected materials are processed sewage wastes, recycled iron oxides, recycled glass, mineral tailings, and other virgin ceramic scrap. All of the materials used in Green Leaf Brick can be classified as post consumer or post industrial (pre consumer). Modular bricks made from stone dust: The Eco-Friendly Modular Bricks produced by Decolores use abrasive mud obtained from the processing of ornamental stones as raw material. It is so interesting to me and I like to have more information on it . Although there are many options you have mentioned but I personally liked the idea of developing Eco friendly bricks with waste newspaper. Haven’t heard about such thing in building materials sector before. Hope they are as good as other bricks in performance. Thanks for sharing this, Owen. Bricks made in a cinva ram are another good option and can be totally made from clay rich soil on site. For the most part this is a list of bricks. I’ve intentionally left out CEBs or earth blocks because they’re bigger and heavier.